I had been searching for a GoPro or similar action camera to record an upcoming driving day experience, so thought that I’d share my experiences here about the Campark ACT74 action camera and accessories that I finally bought. 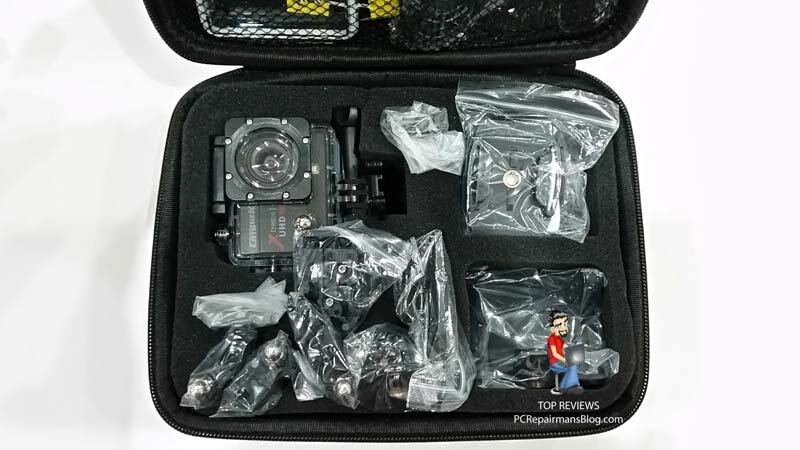 This product is an Amazon best-seller so I read the reviews on there, looked at some decent YouTube GoPro and ACT74 comparison videos (shown below) and made my decision to purchase one. I was still quite sceptical, as often the positive reviews can be faked and likewise the negative ones can be from people overly fussy about irrelevant things (e.g. “there was too much packing material so I gave this item just one star…”). In fairness, the Amazon review system is overall a good indicator, especially when the number of reviewers for a product enters the hundreds. 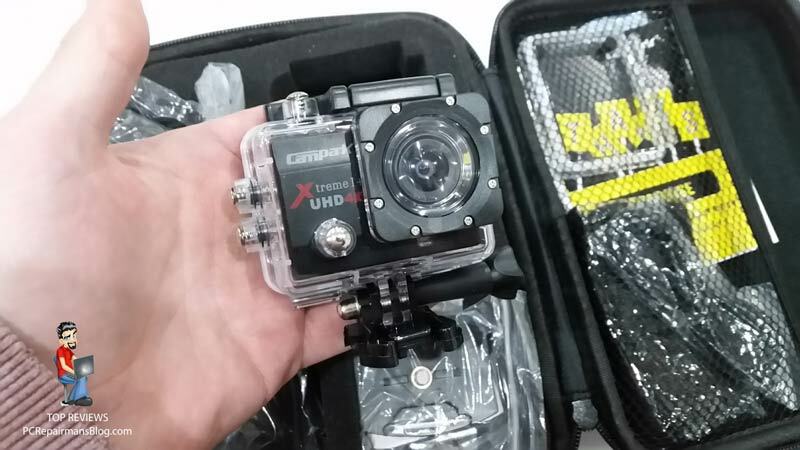 So, this camera retails for UK £39.99 and is pitched firmly against the GoPro entry level Hero 5 Session. The latter, at the time of writing, is about £139.99 so there is a large price difference. You can effectively buy 3 Campark ACT74s for the price of one GoPro and treat yourself to some more accessories with the change! Another notable difference when comparing the two seems to be the 4k video. Surprisingly, the more expensive GoPro Session doesn’t have it but the cheaper CamPark does. So the Campark ACT74 kit arrived the next day at no charge thanks to Amazon’s excellent Prime service. First impressions were of a well-packed item that comes in a very neat travel case. 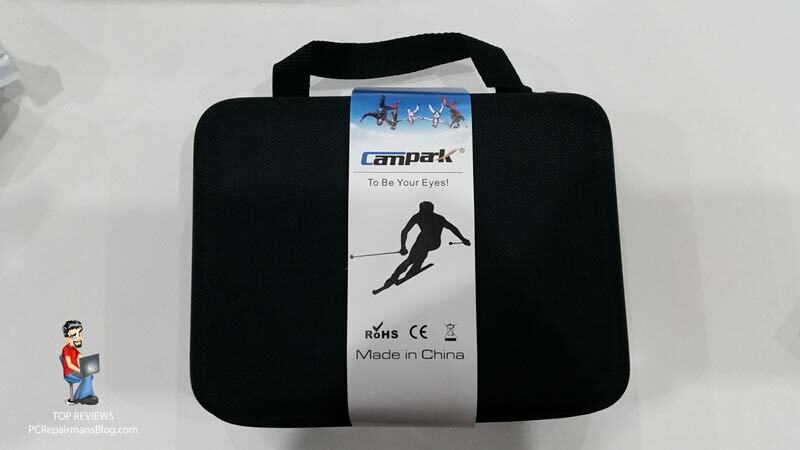 The case carries all the supplied accessories which were good quality items. An IP68 waterproof case, waterproof to 30 Metres. You would use this for underwater filming. Coming with lots of accessories already gives this camera an edge. If it’s easy to mount then you can get up and running straight away. My test of the waterproof case involved initially submersing it in a deep sink; admittedly not the 30 metre depth test that it could have been! I did this without the camera in at first for 30 minutes, then with it inside once I was certain no drops came in. All seemed good, and there is a spare rear cover with a new seal supplied which is nice to have. Remember, each time you put the camera in this waterproof case that you will open and close the access flap (the rear cover), so it will be a point of failure for water ingress eventually. I found that I used the waterproof case for most filming rather than the supplied ‘open’ case that was also sent, but the latter leaves the lens open to dust, scratching, damage etc. and the bespoke waterproof case is not much larger than the camera itself. The rear LCD screen measures 2 inch (5cm) across the diagonal and has a resolution of 960 x 240 pixels which is fine for reviewing your footage. You can see the overall layout and whether the video is likely to be over or underexposed etc. In general the default exposure settings work well. The screen is bright enough to be seen on a sunny day. This obviously eats into the battery life to display anything, but cleverly the ACT74 automatically shuts off the screen to maximise life when it can. Video output format is mp4 (H.264) which is about the most compatible for sharing or working with and supports 4K UHD. The photos have a resolution of 2MB, 5MB, 8MB, 12MB and 16MB but unless memory card space is really at a premium then you’d probably leave this set at the maximum. I’d say that current smartphones way exceed the quality of the photos you get from the Campark ACT74, but you’ll probably be using this for filming rather than stills, and will more than likely have a smartphone with you at all times too. If you’re not understanding the video resolution modes then, simply put, 4k is super sharp and you’ll only notice the difference on 4K televisions or PC monitors. 720P is still pretty good, especially if you’ll be sharing it or uploading to YouTube, social websites or similar. For most real-world usage, you’ll probably leave it in 1080P 60fps mode like I did and this will give you a good compromise of video quality against files storage sizes. 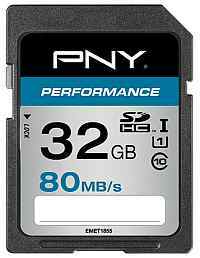 Buying 2 memory cards helps to give you some more emergency storage and protects against card failure stopping your day’s recording. Do read on for some important information on fake cards though! Video output format is PAL (UK Standard before DVB-T) and NTSC (USA standard) through the HDMI port. There is a slow-motion recording setting too if you want to have a bit of fun. Audio in my few weeks of testing was passable but nothing special, the microphone range is not huge and wind noise can be high on a blustery day. A borrowed GoPro Hero 5 session had similar audio quality though and I have seen that the more expensive models aren’t much better. It is what it is, and it’s one of the reasons why most action videos you see out there have music soundtracks. The lens angle is a usable 170 degrees. For general sports camera use this seems very good and it complements a limited angle smartphone or SLR camera very well, giving you a much broader variety of video. One of my main aims is to have this as an in-car camera, recording track days and the like, and it performed very well on a recent test. I’ll upload a snippet for you to see later on. Exposure settings range from -3 to +3 and this gives you decent enough control. The auto-exposure settings worked well when I tested it against direct sun, shaded areas and indoor. Again, don’t expect stunning SLR-quality photos from this device, but that is the same for any currently available action cam including those from GoPro, Sony, Garmin etc. Two batteries were provided in the kit which is great. They are the rechargeable Li-ion type. The kit doesn’t come with a standalone charger but the camera itself can be used to charge them so this isn’t a deal-breaker. Simply plug in the provided USB cable to the side of the camera and plug the other end into a USB output charger (1 Amp or greater) or your laptop/desktop computer. There is a dual charger available for a few pounds but I didn’t need this. For me, the less I need to carry the better. The battery life is difficult to quantify as the unit shuts the screen off after a minute and the whole unit will auto power off after 1, 3 or 5 minutes if not in use. For a real world test, I managed to film for a whole day using the two supplied batteries. This gave me 4 hours of HD 1080p footage (which was filmed over a 7 hour period) and the second battery still had some life in it. This is done through the USB interfaces of your computer. You select ‘USB mode’ when plugged in to a computer and you’ll see all your files there, accessible at USB 2.0 transfer speeds. Another way is to simply plug your Micro SD card into a card reader connected to a computer. The case is a textured plastic material, buttons are easy to use and have a reassuring ‘click’ when pressed. General build quality seems good. This camera supports a single micro SD card up to 64GB maximum. However, please note that there are an incredible number of FAKE cards on the market at the moment. What the sellers of these cards do is take a relatively inexpensive unbranded 8GB card or similar and change the settings on it so that it shows up as a 64GB card. They will then duplicate the writing on the card and put it in accurately copied packaging. The problem is because they can make upwards of £10 per card they are up for sale everywhere, even in big retail stores. Even the feedback from their buyers is often good because the buyer doesn’t realise it’s a fake until the 8GB is used up, which in the case of a camera that overwrites old files and can ‘loop’ all day long it may never be. Some cards do give errors in some devices though but unless you do some more advanced testing like I did, you’ll never know. At this point I’ll mention that I have bought SDHC memory cards from a few places and received some fakes. In each case I got my money back but lost time messing about with returns systems and complaints procedures. Anyway, for UK buyers I would definitely recommend buying at least 2 of these genuine 32GB SanDisk cards so you have decent capacity for a day of filming and the price is good. Using 2 allows you to rotate them and also reduces your chances of missing the all-important filming if one of them dies (which memory cards do from time to time). They have a higher speed class too and this makes a big difference to the use of the camera, don’t buy the slower cards as they will drive you mad, making your device feel sluggish overall. If you’re reading this because you wanted to do a Campark ACT74 vs GoPro Hero 5 session comparison, then that’s where I found myself going a few weeks back. The current ranges of version 5 and 6 GoPros have some pretty negative feedback, especially for reliability, so that’s one reason I went with a cheaper camera. I’d hate to pay upwards of 3 times the price and have a microphone fail or similar and GoPro seem to have more than their fair share of hardware and software issues. For a unit that can be used as an action camera, security camera, dash cam and webcam the Campark ACT74 really does excel. Add built-in time lapse, slow motion, loop recording features and top it all off with 4K video and you really can’t go wrong for the price.